The ASME Innovative Additive Manufacturing 3D (IAM3D) Challenge is designed to give mechanical and multi-disciplinary undergraduate students around the world an opportunity to re-engineer existing products or create new designs. The Innovative Additive Manufacturing 3D Challenge (IAM3D) will be held in collaboration with ASME’s Global E-Fests (Engineering Festivals), a series of 3-day, 2-night regional events built around design, advanced manufacturing and robotics technologies. Expanding knowledge, testing and showcasing new skills, and inspiring innovation….that’s the focus of ASME’s E-Fests. In short, if you’re an engineering student, this is your place to shine and thrive. Are factors influencing the design adequately considered (Energy savings, material cost, Manufacturability, assembly, sustainability)? 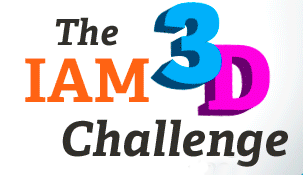 For the second stage of the challenge, at the IAM3D Challenges held at E-Fest events, the selected participants will assemble their design, showcase their functional prototype, and compete in a 10 minute verbal presentation with additional 5 minutes reserved for Q & A.